In our last blog, we began discussing a brief history of locks and the types of locks available to modern users. Today, we want to continue discussing the other types of locks that we did not cover so that you can not only know more about the types of locks that you may find in your home, a favorite jewelry box, your grandmother’s lockbox, and those that protect your business. The locksmiths of Affordable Locksmith of Texas want to help residents in the Spring, Texas area know more about locks so that they can not only know when they need to up their security, but also when they can relax and know they are secure. Continue reading to learn more about locks! In our last blog, we discussed the main types of deadbolts used today: single cylinder and double cylinder. These, however, are not all the types of cylinder locks available. Other cylinder locks include mortise and rim cylinder locks which are considered by some locksmiths to be more secure than deadbolts and are most often used on commercial doors, glass doors, and apartments. There are also interchangeable core cylinder locks, rim latch locks, and key in knob cylinders. In Europe, 150 years ago, locksmiths agreed on a standard lock to streamline the manufacture and maintenance of locks. These locks are similar to deadbolts, but have only one point of attachment, making them easy to break. Many older styles of furniture and luxury furniture have locks or locking compartments. The two main types of locks used include bolt style and push button style. Bolt style locks have a flat piece of metal that extends out from the lock to secure the drawer or furniture door. The push button locks are mainly used on filing cabinets and some sliding glass doors. These locks have a metal rod that goes out the back of the lock mechanism when the lock is secured and is retracted when it is unlocked. These locks also pop out and just have to be pressed back into their shell when you want to secure. Wall mounted locks are usually used to hold other keys, such as those needed by businesses for their emergency access. These locks are normally called a Knox box or fireman’s box. As mentioned earlier in our blog, locks are constantly evolving to better serve our changing society and the technology that we use. Electronic locks have been used by businesses for years, but are also being employed in homes as well. Some electronic locks use a keycard to open. Hotels and businesses employ these types. Pin pad locks are secured through a code. Smart locks are becoming more popular as well with the use of smartphones: these locks can be locked and unlocked remotely using a app. 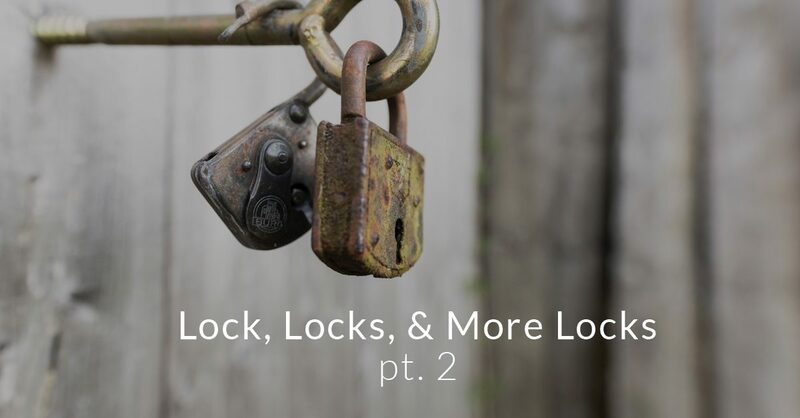 We hope you’ve enjoyed this short series about locks and can, as a result, feel more educated about the security features that you have in your home and business. Still have questions? Contact our locksmiths! They would love to help you better secure those things that matter the most to you! Visit our website to learn more about our locksmith services we offer to Spring!